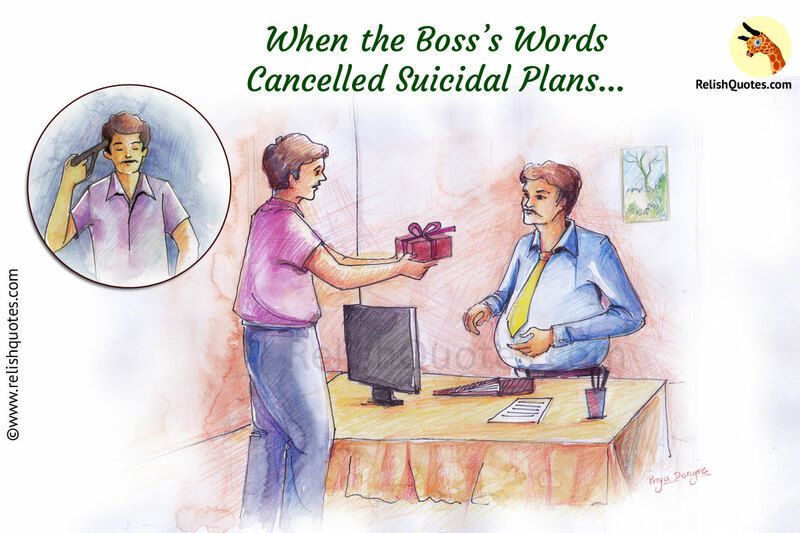 Inspirational Short Story – When the Boss’s Words Cancelled Suicidal Plans…. It’s the nerve wrecking stress and pressure of meeting deadlines that cause sky-rocketing death and suicidal cases starts to soar high. The same pressure can be eased out and cooled down if a few words of positive feedback, affection, encouragement, and motivation are spoken to employees by the boss. Such is one case from the life of Tim Sanders-coach for leadership and Ex-Chief Solutions Officer at Yahoo.com. He often goes down the memory lane and gets nostalgic about how he used to have one-on-one conversations with his employees, appreciate them with sweet words. Even now, during training sessions, he advises the bosses to reach out to their subordinates and appreciate their efforts. Sanders, recalls one very special incident that happened in his life where the words that he spoke to one of his employees, stopped the employee from committing suicide. After a few days when the man returned, he came along with an expensive X-Box Console for Sanders. When Sanders curiously asked the man revealed the entire shocking story. That man was frustrated, fed up, disheartened and had decided to end up his life, but the sweet, caring, personal, special time all of this given by his boss, turned his mind away from suicide. He, in return, made his way to a psychiatrist to get counseling g on depression. The X-Box Console that he brought for Sanders was by pawning the revolver he had bought with the intention of ending his life with. Had his boss and his sweet words not been there, he wouldn’t have been alive…. Balance your personal and professional life well. It’s a wonderful relation if a superior at work becomes your best friend too! Speak morale boosting and positive words…. You have no clue they might help someone out in the most unexpected way!